Abbiamo già cominciato a discutere nel thread dei piani di Putin per l'Europa, ma vista l'importanza dell'argomento e alla luce di quanto sta succedendo in Ucraina direi che si merita un thread apposta. Conoscendolo sarà senz'altro un trucco per cercare di prendere tempo fino all'anno prossimo, ma è già un fatto rilevante che sia stato costretto a tornare formalmente indietro. 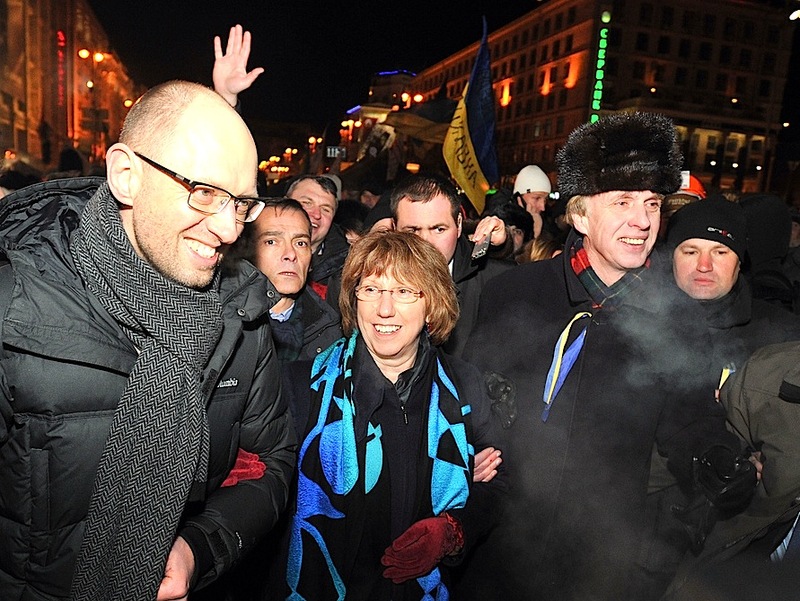 L'alta rappresentante dell'UE, la sig.ra Catherine Ashton, è stata in visita in Ucraina. Prima ancora di incontrare Yanukovich, ha potuto girare ieri mattina per Kiev, sostando anche nella centrale piazza Maidan dove stava per iniziare il trambusto di dimostranti un po' turbolenti e, soprattutto, dell'intervento della polizia. EUobserver.com ancora ieri dava rilievo al fatto che il montare della protesta dei manifestanti pro-Europa si svolgesse "sotto il naso" dell'alta rappresentante. Come è già stato segnalato da altri, Yukanovich sembra fare "marcia indietro": firmerebbe il trattato di libero scambio con l'UE. Ma siccome l'Ucraina è povera e (dice lui) l'abbandono di un analogo accordo con la Russia è per l'Ucraina un aggravio economico, la mette in modo da far apparire che è l'UE a guadagnarci: e chiede qualcosa come 10 milioni di euro in cambio della firma di quell'accordo! La Ashton ha già fatto i suoi commenti da Kiev al suo incontro con Yukanovich parlando ai giornalisti. Ha detto di nutrire dubbi sulla serietà del cambio di rotta che Yukanovich intraprende (ora che è alle strette con una situazione di mezza rivoluzione). Trascrivo di seguito i due più recenti articoli di EUobserver sull'Ucraina. visit by EU foreign policy chief Catherine Ashton. BRUSSELS - Riot police have attacked pro-EU protesters in Ukraine during a visit by EU foreign policy chief Catherine Ashton. The crackdown on the Maidan square in central Kiev began at 1am local time on Wednesday (11 December) morning. Clashes went on through the night, with reports of injuries on both sides. The situation calmed down at about 7am. But thousands of protesters and hundreds of police remain in the square and in nearby streets. Pro-EU crowds set up camp in the Maidan on 21 November, when Ukraine President Viktor Yanukovych said No to an EU association treaty. But the order to dismantle the barricades came in the middle of a rare visit to Ukraine by Ashton. The EU's top diplomat met with Yanukovych for three and a half hours on Tuesday. She also visited the Maidan at 8pm on Tuesday night. "Some hours later I observe with sadness that police use force to remove peaceful people from the centre of Kiev. The authorities didn't need to act under the coverage of night to engage with the society by using police," she said in a statement on her Facebook page. US secretary of state John Kerry voiced "disgust." Opposition leader Arseny Yatsenyuk, who had escorted Ashton on her Maidan visit, added: "He [Yanukovych] is spitting in the faces of the United States, 28 countries of Europe, 46 million Ukrainians … Tomorrow there will be a million people here and his regime will fall." The crackdown also came on the eve of Ukraine deputy PM Serhiy Arbuzov's trip to Brussels. Arbuzov is to bring proposals for what he calls an EU "Marshall Plan" - demands for up to €20 billion of extra funds to implement the association pact. Earlier on Tuesday, Yanukovych said on TV he is ready to sign the treaty at an EU-Ukraine summit in March. But EU diplomats have lost faith in the President despite the ongoing talks. Contacts say Yanukovych is playing Brussels against Moscow, asking each side for more money to help him win 2015 elections. "He doesn't have the slightest intention of signing the treaty before the vote," one EU source noted. "The Arbuzov visit is a smoke screen - Yanukovych will send the whole Ukrainian disneyland to Brussels to create the impression that he is ready to sign the association agreement," the contact added. "The EU will probably play along because it doesn't have a plan B," the source said. Ukraine President Yanukovych after a second meeting in Kiev. BRUSSELS - EU foreign affairs chief Catherine Ashton has voiced doubt on the integrity of Ukraine President Viktor Yanukovych after their second meeting in Ukraine. Speaking to press in Kiev on Wednesday (11 December) she said the Ukrainian leader: "assured me when I met him that he does intend to sign the [EU] association agreement." She noted, however: "I merely tell you that that's what he's been saying." She added: "I have to accept that what the President says to me, is what he's saying to me, for me to carry back the message. But you know, it's always important to verify by seeing what happens next and we want to see what is said turned into what is done." Ashton spoke following an attack by riot police on pro-EU protesters on Wednesday morning. She also spoke after Ukrainian PM Mykola Azarov told media that Ukraine wants €20 billion in extra money to implement the EU pact. She indicated the EU is unwilling to pay. "This is not about bids for this country … This is not a decision about 'Oh here's x amount of money if only you'll sign.' We're not interested in that," Ashton said. Her remarks come amid ongoing EU-Ukraine talks on reviving the treaty, however. 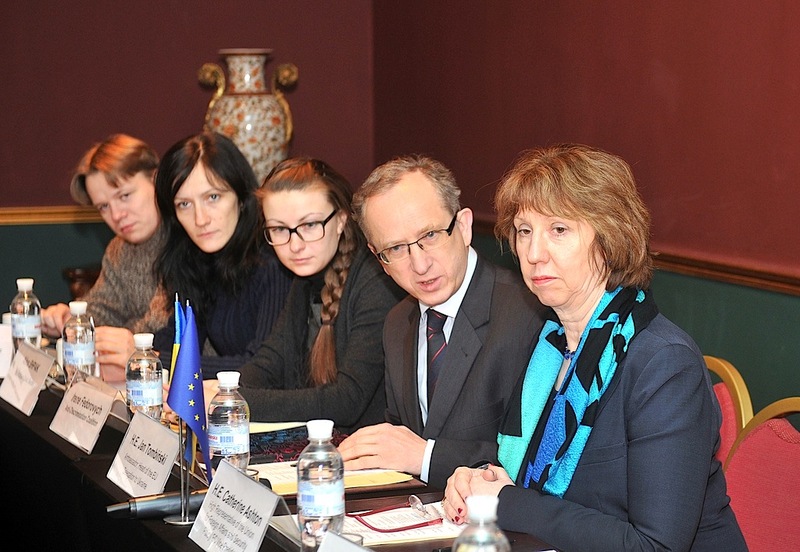 Ukrainian central bank and foreign ministry officials met with her staff in Brussels last week. Ukraine's deputy PM, Serhiy Arbuzov, is also planning to come to the EU capital on Thursday. At the same time, EU countries are in talks with international lenders - the European Investment Bank, the European Bank for Reconstruction and Development, the International Monetary Fund and the World Bank - on potential Ukraine aid. "If you ask them, they will deny it, but behind the scenes there is a lot of discussion going on along those lines," an EU source told the Reuters news agency. Ashton declined to speak of sanctions if police violence continues. But the US on Wednesday did not rule out punitive measures. A US state department official, Jen Psaki, told reporters in Washington that the US still sees "an opening … to move toward European integration." She added, however: "All policy options, including sanctions, are on the table in our view." US sanctions would hurt Ukraine much less than EU travel bans or asset freezes on Ukrainian oligarchs and politicians. Many of Ukraine's big men have business and personal assets in EU countries. Rinat Akhmetov, Ukraine's richest man and a leading sponsor of Yanukovych's Party of the Regions, for one, owns steel plants in Bulgaria, Italy, and the UK, as well as a €160 million apartment in London. Meanwhile, EU diplomats are watching Ukrainian TV to see which way the wind is blowing. Akmhetov and other oligarchs, such as Ihor Kolomoyskyi, Victor Pinchuk and Dmitry Firtash, own TV stations which used to be loyal to Yanukovych. They have been broadcasting continuous footage of protests and police violence in recent days. But their intentions remain unclear. An EU diplomat told this website the broadcasts might be an "insurance policy" to keep themselves off any future EU blacklists. They might also be designed to help Yanukovych sign a rival pact with Russia, by prompting the EU and US to cut ties and allowing him to blame the West for his decision. Yukanovich sceglie l'offerta-ricatto di Putin (di stretto legame con Mosca e salvataggio russo) abbandonando così l'alternativa di un trattato con l'UE. Leggete qui l'apposito articolo di EUobserver.com. bailout instead of the EU alternative. Chissa perché me lo immaginavo. Il Magnate (nel senso di magnone) russo, nonché ex-KGB, nonché amico di un altro Magnate nostrano senza passaporto, lavorando sotto-sotto c'è l'ha fatta. Del resto l'europa non può dare all'Ucraina il Gas. La russia sì. La situazione ucraina non è affatto chiarita. Yanukovich aveva chiesto all'UE 10 milioni di Euro, equivalenti a 13-14 milioni di dollari. Putin, quindi "promette" un po' di più- Ma non veri "prestiti" in moneta forte, bensì l'acquisto (suppongo in rubli) di bond ucraini. E qui non sappiamo di che si tratta di preciso. Sarò sospettoso, ma ci vedo un modo per ulteriore intromissione russa negli affari interni ucraini. Oh: mica subito, ma tra 5 anni! Magari quando Putin si ritirerà dalla scena politica. «Meanwhile, few in Brussels believe the Russian deal is as good as it sounds. The EU source told this website that Russia has in the past pledged cheap loans to Belarus and Ukraine, without paying a cent. «"The question now is what Yanukovych will do with all those people who are still on the streets of Kiev," the source added. Ma qui Yanukovich avrà la meglio! Non ci sono gli interessi (su petrolio e altro) che c'erano a riguardo della Libia e, in generale, della cosiddetta "primavera araba" a far muovere le potenze occidentali. Basterà che invece di usare la forza aspetti senza far niente, nemmeno rispondere! Alla lunga, i dimostranti, frustrati ed esausti, smetteranno di protestare (inutilmente!). Intanto bisogna vedere se lo Zar si ritira davvero... Mi sembra un po' tanto parente del suo "amico" Italiano. Anche formalmente non c'è problema: alternandosi a Medviedev o altri suoi amiconi potrebbe rimanere tranquillamente in sella per un bel pezzo. Occhio: Per errore, al posto di aggiungere un nuovo messaggio, ... non so come è successo, ho sostituito il messaggio che avevo inviato verso la fine di dicembre con quello nuovo che volevo invece aggiungere. Dunque, la data vera di inserzione di questo mio 'post' fate finta che sia il 29 (o il 30?) dicembre scorso. Come avevo detto (non so più dove di preciso), a lungo andare perdono i "dimostranti" pacifici se, invece di reagire con repressione violenta, la polizia governativa si limita ad aspettare (e le autorità nicchiano, senza rispondere affatto alle domande e richieste dei "dimostranti"). A lungo andare i "dimostranti", se non perdono per abbandono del morale vedendo l'improduttività delle loro manifestazioni, perdono la partita per esaurimento fisico! The EU this year lost a battle for Ukraine, but nobody is laughing at its "soft power" any more. EUROPE IN REVIEW 2013 - The EU this year lost a battle for Ukraine, but nobody is laughing at its soft power any more. Ever since the Orange Revolution in 2004, the EU and Russia have been pulling the former Soviet republic in opposite directions. The EU incentive was a "deep and comprehensive" free trade agreement, or DCFTA, described by the people who drafted it as a "blueprint for future accession." Ukraine's DCFTA signature was to crown an EU summit in Vilnius on 28 November. In the run-up to the event, EU countries agreed to do it even if he kept opposition leader Yulia Tymoshenko in jail. "It's sad, but true. 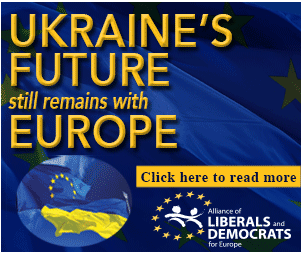 The future of Ukraine is more important than the future of one woman," one EU diplomat said. If Yanukovych took the EU path, it would mark a geopolitical shift in Europe. Russian leader Vladimir Putin needs Ukraine to be the cornerstone of his "Eurasian Union" - a project to revive Russian hegemony in the east. He also needs to show pro-democracy movements in Russia there is no hope for reform in the former Soviet domain. But on 21 November, Yanukovych shocked the EU by saying No. He still went to Vilnius. A video published by the Lithuanian EU presidency showed the stony-faced former lorry driver talking about Russian pressure to German Chancellor Angela Merkel. "Nice of you to come. But we expected more," Merkel said. "[Yanukovych] is from a different civilisation. He is not a partner for Europe," British Prime Minister David Cameron reportedly told colleagues. The Ukrainian leader shocked Europe once again a few hours later. At 4am the day after Vilnius, his riot police attacked a group of students at a pro-EU protest in Kiev. But the biggest shock came next, when up to half a million Ukrainian people joined street protests waving EU flags and calling on Yanukovych to go. The numbers dwarfed the Orange Revolution itself. Police clashes got worse and EU diplomats, who expected a mass-scale crackdown, began talking about Ukraine as Belarus II: autocratic; isolated; under Russia's boot. Yanukovych in December accepted a $15 billion Russian bailout instead of the EU offer. He says he is still interested in reviving the EU deal in the new year, but no one in European Union circles believes him. Meanwhile, the pro-EU barricades are still there in Kiev. On Sunday (29 December) a few thousand demonstrators even marched toward Yanukovych's private mansion to voice anger on state corruption. Their number is dwindling despite fresh scandals, such as the vicious roadside beating of investigative journalist Tetyana Chornovil. But even if the EU has to wait until Yanukovych leaves power before resuming the DCFTA process, the events in Ukraine this year have made their mark. People have stopped laughing at the EU's "soft power" and "benchmarks" after the huge rallies in Kiev. They have also noticed that Ukraine exists amid other priorities in Iran and Syria. EU Council chief Herman Van Rompuy told press at an EU summit in December: "The most significant development for Europeans currently is the peaceful popular protest in Ukraine." A senior EU official told this website: "It goes to show that what we take for granted in Europe - rule of law and political freedom - is a rare and precious thing." "The reason why Ukrainians want to get closer to Europe is precisely because we did not go for some cheap deal with Yanukovych. Because we have standards and values," he added. This article was printed in EUobserver's yearly magazine 'Europe in review 2013'. The print edition looks back at the most important stories of the year. To obtain a copy of the magazine, please contact mc@euobserver.com. Price per copy €4.75 + postage, excl. vat. Discounts on larger purchases. Piena solidarietà dell'ALDE agli europeisti ucraini. Cosa farà l'Italietta contro la Cina o L'India (ri-confrontate le dimensioni), se esce dall'Europa? Sale a 75 il bilancio ufficiale delle persone che hanno perso la vita in questi tre giorni di scontri a Kiev. Lo fa sapere il ministero della Salute ucraino in un comunicato precisando che 76 feriti versano in gravi condizioni. Il parlamento ucraino ha condannato l'uso della forza contro i manifestanti e ha proibito le "operazioni antiterrorismo" annunciate dai servizi segreti (Sbu). Lo fa sapere l'agenzia Interfax precisando che a pronunciarsi in tal modo sono stati 236 deputati su 450 (238 quelli presenti). Scorre il sangue e sibilano le pallottole dei cecchini a Kiev, mentre l'Ucraina sprofonda nel baratro della guerra civile. Uno scenario paventato da giorni, ma che i passi delle cancellerie stentano ad arginare sullo sfondo di un confronto fra Mosca e occidentali che si fa rovente a un passo dai confini russi. La tregua annunciata ieri sera dal presidente Viktor Ianukovich, a dispetto del fumo e delle fiamme che ancora si levavano da Maidan (la Piazza dell'Indipendenza simbolo delle proteste antigovernative di questi mesi), non ha retto che poche ore. La capitale ucraina fin dal mattino è ripiombata nel caos e il fuoco incrociato di pistole e armi automatiche ha lasciato sul terreno decine di morti: "cento", secondo la stima di Sviatoslav Khanenko, deputato del partito nazionalista Svoboda e responsabile dei servizi medici della piazza. I feriti si calcolano invece a centinaia e almeno 67 poliziotti - stando al ministero dell'Interno - risultano essere in ostaggio nelle mani degli insorti. Non è chiaro chi abbia dato fuoco alle polveri. I dimostranti accusano le forze di sicurezza di aver violato platealmente il cessate il fuoco tentando un nuovo assalto alle barricate di Maidan. E bollano come agenti o come "provocatori" i cecchini visti sparare dai tetti circostanti. Il governo ammette da parte sua per la prima volta l'uso di proiettili veri da parte degli agenti, ma parla di "legittima difesa" e punta il dito contro gli "estremisti" della piazza: a cominciare dai bellicosi attivisti di estrema destra di 'Pravi Sektor', che fin da subito avevano rigettato ogni tregua. Il sindaco di Kiev però denuncia il "bagno di sangue" e abbandona il partito di Ianukovich. Di certo c'è che decine di persone sono state colpite da pallottole, con tiri spesso mirati a testa e gola, come nel caso di Olesya Zhukovskaya, la giovane infermiera che dopo essere stata ferita ha twittato al mondo il suo j'accuse: "Io muoio". Bonino, decise sanzioni Ue - "In accordo" con i tre ministri a Kiev "la decisione è di procedere molto rapidamente nelle prossime ore a un bando, a coloro che in Ucraina si sono macchiati di violenza, sui visti e sugli assetti finanziari". Lo ha detto Emma Bonino lasciando il Consiglio Esteri prima della conclusione. La ministra degli esteri ha annunciato anche un apertura di facilitazioni di visti "per i feriti, la società civili e i dissidenti". La decisione sulle sanzioni non è stata ancora presa formalmente dal Consiglio, ma è imminente. Casa Bianca, Ianukovich ritiri forze sicurezza - Il presidente ucraino Viktor Ianukovich deve ritirare immediatamente la sue forze di sicurezza e rispettare il diritto a una pacifica protesta. Lo afferma la Casa Bianca. Il presidente americano, Barack Obama, ha avuto un colloquio telefonico con la cancelliera tedesca, Angela Merkel, per fare il punto sulla situazione in Ucraina. I due leader - informa la Casa Bianca - si sono detti d'accordo per sostenere "una fine immediata delle violenze e una soluzione politica che sia nell'interesse del popolo ucraino". Negli Stati Uniti è pronto un decreto per congelare gli asset delle personalità o entità ucraine coinvolte nella repressione in atto a Kiev. Lo afferma la Cnn citando fonti dell'amministrazione americana. E' probabile - si aggiunge - che il presidente Obama firmi il provvedimento nelle prossime ore. Si aspetta solo di vedere gli sviluppi degli sforzi diplomatici in corso, per evitare che la decisione di varare le sanzioni si trasformi in una mossa controproducente. Mosca avverte Kiev,autorità non siano zerbino - Non collaboreremo con un governo "zerbino" ma con autorità "legittime", "efficaci" e in grado di difendere "gli interessi dello stato". E' l'avvertimento del ministro degli esteri russo Dmitri Medvedev. "Bisogna che i nostri partner abbiano autorità, che il potere in Ucraina sia legittimo ed efficace - ha detto - e che non venga calpestato come uno zerbino". Dichiarato decaduto dal Parlamento, Yanukovych fugge nell'est del paese (mezzo-russo e filo-russo) a Charkiv. Ma lui, Viltor Yanucovych, non è d'accordo. Intanto a Kiev trionfa la Tymoshenko. Oggi mi è stato segnalato per e.mail un articolo interessante scritto da una persona che non è un giornalista ma, per motivi "professionali", conosce benino l'Ucraina (molto meglio – sembra – di tante altre fonti mediatiche). L'altro giorno la Merkel, deplorando l'intervento russo in Crimea, aveva detto che però la cosa non avrebbe pregiudicato il prossimo G8 (che è previsto in Giugno a Sochi, dove si sono svolte le olimpiadi invernali). Ma poi Cameron ha dichiarato la sua non disponibilità ad andare a Sochi. Adesso è l'intero G8 – pardon: G7, tutti ad esclusione del governo russo, of course – a mettere le mani avanti. stand ready to assist with these efforts. Anche il Consiglio dell'Unione Europea prende posizione sulla nuova situazione venutasi a creare con l'invasione della Crimea da parte dei russi. "1. The European Union strongly condemns the clear violation of Ukrainian sovereignty and territorial integrity by acts of aggression by the Russian armed forces as well as the authorisation given by the Federation Council of Russia on 1 March for the use of the armed forces on the territory of Ukraine. These actions are in clear breach of the UN Charter and the OSCE Helsinki Final Act, as well as of Russia's specific commitments to respect Ukraine's sovereignty and territorial integrity under the Budapest Memorandum of 1994 and the bilateral Treaty on Friendship, Cooperation and Partnership of 1997. These actions are also a clear breach of the Ukrainian constitution which specifically recognises the territorial integrity of the country and states that the Autonomous Republic of Crimea can only organise referenda on local matters but not on the modification of the territorial configuration of Ukraine. The EU calls on Russia to immediately withdraw its armed forces to the areas of their permanent stationing, in accordance with the Agreement on the Status and Conditions of the Black Sea Fleet stationing on the territory of Ukraine of 1997. Russia should also without delay agree to the request by Ukraine to hold consultations, as foreseen in the bilateral Treaty on Friendship, Cooperation and Partnership of 1997, and to take part in urgent consultations among all signatories and adherents of the Budapest Memorandum of 1994. The EU calls for a peaceful solution to the current crisis and full respect of the principles of and obligations under international law. The EU remains ready to engage in and promote any constructive dialogue with all parties aimed at reaching such a peaceful solution and will continue its engagement in international facilitation efforts, working with the UN, the OSCE, and other international actors, including on proposals for international observation and mediation, and welcomes a possible OSCE fact finding mission in this regard. The Council recalls the EU's ambitions and openness to a relationship with Russia based on mutual interest and respect and regrets that these common objectives have now been put in doubt. The EU and those Member States who are participants of G8, have decided for the time being to suspend their participation in activities associated with the preparations for the G8 Summit in Sochi in June, until the environment comes back where the G8 is able to have meaningful discussion. In the absence of de-escalating steps by Russia, the EU shall decide about consequences for bilateral relations between the EU and Russia, for instance suspending bilateral talks with Russia on visa matters as well as on the New Agreement, and will consider further targeted measures. The Council decides to remain permanently seized, in order to be in a position to take rapidly all necessary measures. The European Union commends the measured response demonstrated so far by Ukraine . The European Union stands by the efforts of the new Ukrainian Government to stabilise the situation and pursue the course of reforms. The EU reaffirms the necessity of further constitutional reform in Ukraine and to hold free, fair and transparent Presidential elections with OSCE-ODIHR observation. The EU reaffirms the utmost importance of ensuring inclusiveness at all levels of government by the Ukrainian authorities, including through steps designed to reach out to all Ukrainian regions, population groups and to ensure full protection of national minorities in accordance with Ukraine’s international commitments. In this regard, it encourages Ukraine to draw on the expertise of the Council of Europe and the OSCE. The EU is ready to further pursue its efforts with the international community and international financial institutions, especially the IMF, to assist Ukraine. To this end, the EU and its Member States will lend their full support to an international assistance package to address the urgent needs of Ukraine, based on a clear commitment to reforms. The Council welcomes the efforts already undertaken by the Commission, which has dispatched a fact-finding mission to Kyiv in parallel to the IMF mission. The Council also encourages interested third countries to join such an international assistance package. Recalling its conclusions of 20 February 2014, the Council agreed to swiftly work on the adoption of restrictive measures for the freezing and recovery of assets of persons identified as responsible for the misappropriation of State funds, and the freezing of assets of persons responsible for human rights violations. The Council reconfirms its offer of the Association Agreement, including a Deep and Comprehensive Free Trade Area. The Agreement would bring opportunities for sustainable economic development and prosperity to all the regions of Ukraine, including Crimea, as well as to its neighbours. The Agreement does not constitute the final goal in EU-Ukraine cooperation. The EU reiterates its commitment to enhance people to people contacts between the EU and Ukraine, i.a. through the visa liberalisation process, in line with agreed conditions in the framework of the VLAP. The Council calls on High Representative Catherine Ashton to continue her contacts with all parties with a view to contributing to a peaceful resolution of this crisis." “Kharkiv” è la grafia inglese della città ucraina a maggioranza russa (o almeno filo-russa) dove si diceva che si fosse rifugiato Yanukovich (a cercare sostegno “tra i suoi”). No one can claim to speak for all of Crimea, but its Tatars, returned from Soviet-era exile, can hardly welcome Russia’s embrace. Victims of any military action are inevitable, and Russia’s pretence that it is bringing troops into another sovereign country “to protect Russian nationals” should convince nobody. Among the planned victims are the indigenous Crimean Tatars, who in just over two months will be commemorating the 70th anniversary of their deportation as a people from their native land. In May 1944 it was Stalin who used defamation and propaganda to try to justify a terrible crime. In March 2014, it is Vladimir Putin. There is probably no reason to doubt the sincerity of those ethnic Russians in the Crimea who are loudly welcoming the moves by Russia that began with the effective seizure of Simferopol on 27 February. Neither Russian flag-waving crowds nor the unprecedented 95,000 ethnic Russians and Russian-speakers who have in the last 36 hours told Putin that they don’t want Russia’s “help” can in themselves prove what the majority in the Crimea want. Nor can the deployment of Russian troops. The reports in the Western media on Saturday that only Russian supporters were visible were superficial and misleading. Ukraine’s leaders in Kyiv and the leaders of the Crimean Tatars had called on people to avoid escalating the situation. Certain moves, such as the attempt to seize the building of the Mejlis (the representative body) of the Crimean Tatars, were almost certainly aimed at provoking confrontation between the Tatars and pro-Russian groups. When the Crimean Tatars did not succumb to provocation, Russia came up with a supposed attack, resulting in casualties, on the Interior Ministry building in Simferopol. Although the police shortly refuted the entire story as never having happened, an appeal for “Russian help and support” was issued by Sergei Aksenov. A Russian national, Aksenov supposedly ousted the Crimea’s prime minister, Anatoly Mohylyov, during a vote in the seized parliamentary building on 27 February. In the last parliamentary elections, Aksenov’s Russian Unity party received only 4 percent of the votes and just three seats in parliament. The plans for a referendum allegedly “adopted” in a parliament surrounded by gunmen should not be seen as even providing a thin democratic coating. According to Article 73 of Ukraine’s constitution, any referendum on changes to Ukraine’s territory must be nationwide. On 1 March, Aksenov announced not only that he was seeking “Russian protection,” but also that the “referendum” would be held at the end of March. With gunmen presumably protecting Russian nationals’ interests at the polling stations. The permission from Russia’s rubber-stamp legislative bodies to deploy troops on Ukrainian territory, not just the Crimea, also steeply raises the stakes. Even if this carte blanche proves to be saber-rattling and interference is confined to the Crimea, there remains one other vital difference. The Crimea is the homeland of the country’s indigenous population, the Crimean Tatars. Once deported en masse, they always dreamed of returning, and were welcomed back, if not provided with adequate measures to meet their needs, as soon as Ukraine gained independence. The Crimean Tatars are happy to be Ukrainians and are adamant that their native homeland is a part of Ukraine. They have no other, and any attempt to change the Crimea’s status would leave up to 15 percent of the peninsula’s population, its indigenous people, without a place to go. After years of strained relations with pro-Russian groups, as well as for historic reasons, any measures to bring the Crimea closer to the Russian Federation would meet with strong resistance. It is likely that this resistance is what Putin is trying to provoke, with inevitable bloodshed used to justify intervention, greater control in Ukraine, or simply to avenge himself for yet another aborted attempt to rebuild Russia’s empire. There would be more than merely moral betrayal if the West does not adequately enforce the Budapest Memorandum and all international guarantees of Ukraine’s territorial integrity. This would particularly betray the Crimean Tatars, whose rights the OSCE and EU have repeatedly called for the reinstatement of. There would also be political danger. Ukraine is now so vulnerable because it gave up its nuclear weapons in 1994 in exchange for guarantees from the United States and Russia of its territorial integrity. What price any such agreements if this one is flagrantly breached? It is no accident that the Munich Agreement has been repeatedly recalled over recent days, nor that Poland is at the forefront of demands that the EU and NATO take strong measures. Poland has every reason to remember the fake elections used after World War II to provide justification for Stalin taking control of the country. It understands, as we all should, that unimpeded acts of military aggression against a neighboring state pose a danger far beyond Ukraine’s borders. Halya Coynash is a journalist and member of the Kharkiv Human Rights Protection Group, on whose website this commentary originally appeared. Dopo la dissoluzione della URSS il governo ucraino vendette agli usa le testate atomiche della ex-URSS in cambio di denaro e di un trattato (firmato dagli usa e dai servi della little britain) che assicurasse l'integrità del suo territorio. Oggi la russia, come stato, non può accettare, da un punto di vista geopolitico.che il governo ucraino sposti a suo piacimento l'influenza degli usa nel suo cortile di casa. A mio modesto parere la pseudo-crisi attuale vuole semplicemente prevenire quanto successe quando la URSS tentò di installare i suoi missili a cuba. Mah ...di certo c'è il fatto che l'Ucraina ricopre una posizione geografica di valenza strategica fondamentale per la Russia. In essa corre il perno della sua difesa, per la quale è disposta a soprassedere a qualsiasi problematica di tipo economico con l'Europa, che a sua volta pare stringere alleanza con gli Usa nel tentativo di far saltare il controllo sulle risorse siberiane (solo a febbraio è stato trovato in Sakhalin un immenso giacimento petrolifero). Quindi a mio parere, i russi si annetteranno definitivamente la Crimea (come ormai chiaro) e poi agganceranno nella propria sfera tutta l'Ukraina, fatta eccezione forse per la Galizia e le aree Magiare, oltre quelle rumene in cambio della chiusura dell'annosa questione della Transistria. A mio parere, la Russia non rinuncerà tanto facilmente a Kiev per non considerare che questa mossa occidentale potrebbe veramente essere la mossa genitrice per una futura guerra est-ovest ...per non palare della ripresa certa della guerra fredda e francamente mi domando se ne valesse la pena!!! Metto di seguito un articolo di EUobserver.com sulla situazione Ucraina che diventa sempre più grave. Mi rendo conto che l'argomento, ormai, non è più consono al titolo di questo thread. Tuttavia esiste un legame – come dire? – "storico", di eventi concatenati, tra le iniziali manifestazioni contro il governo del mezzo-dittatore filo-russo Yanukovich (Janukovyč) per un rapporto più stretto con l'UE e i successivi drammatici avvenimenti. Ecco perché penso che, nonostante l'allontanarsi del tema di apertura di questo thread, sia giusto continuare ad inserire qui le notizie (e l'eventuale discussione) sulla situazione ucraina. BRUSSELS - Ukrainian forces killed up to five pro-Moscow rebels on Thursday (24 April) prompting Russia to launch army drills near the border and raising fears the crisis is escalating. EU foreign affairs spokesman Michael Mann told reporters in Brussels that all parties to the joint Geneva statement must put pressure on the groups to help diffuse the recent rise in tensions. “All parties to the joint Geneva Statement on Ukraine of 17 April must ensure that its terms are fully implemented,” he said. The agreement calls upon all illegal armed groups to disarm, vacate illegally seized buildings and occupied streets, squares and other public places in Ukrainian cities and towns. His US counterpart Secretary of State John Kerry in Washington accused Russia of "distraction, deception and destabilisation" in eastern Ukraine. Kerry said Russia is not abiding by the Geneva statement. “Not a single Russian official, not one, has publicly gone on television in Ukraine and called on the separatists to support the Geneva agreement,” he said. Kerry said Russia needs to implement its side of the agreement or risk facing additional sanctions. “If Russia continues in this direction, it will not just be a grave mistake, it will be an expensive mistake,” he said. But key government buildings in dozens of eastern Ukrainian towns remain occupied by pro-Russian separatists. At least two separatists were killed following raids by Ukraine forces earlier in the week on pro-Russian checkpoints around Sloviansk. "If the regime in Kiev has begun using the army against the population inside the country, then this is undoubtedly a very serious crime," President Putin told Russian media. The raids provoked new Russian military exercises along the border on Thursday. Russia has around 40,000 troops amassed next to Ukraine. Ukraine's acting president, Oleksandr Turchynov, said Russia must pull back its forces and “stop the constant threats and blackmail”. EU foreign affairs chief Catherine Ashton, for her part, said the latest news from Eastern Ukraine on reported kidnappings, torture and killings is “a cause for grave concern”. Kiev last week accused Moscow of the murder of a regional Ukrainian politician. Meanwhile, unnamed sources told Reuters the US is set to discuss imposing additional sanctions in a conference call on Friday with British Prime Minister David Cameron, French President Francois Hollande, German Chancellor Angela Merkel and Italian Prime Minister Matteo Renzi. Mann, for his part, noted discussions to impose any additional sanctions is “an on-going process which requires a lot of work and co-operation with our member states”. EU foreign ministers are set to meet to discuss Ukraine on 12 May. A mio modesto parere, la questione Ucraina va oltre i meri motivi di sicurezza geopolitica tra USA e Russia. La questione è puramente di supremazia economica, ora che sullo scenario mondiale, con l'affacciarsi dei paesi BRICS, alcuni equilibri di alleanza economica iniziano a scricchiolare. La Russia vuole utilizzare la questione Ucraina per condurre verso la fine il predominio del dollaro nelle transazioni economiche, e con esso tutto l'Occidente, incluso la stessa Europa. Segnali già latenti in passato - che non sono sfuggiti agli addetti ai lavori - di questioni che stanno emergendo ed amplificandosi nella recrudescenza degli eventi da guerra civile in Ucraina. I primi segnali di affermazione egemonica tra vecchie super potenze - sempre secondo il mio modesto parere - sono iniziati con la guerra civile in Siria; poi lo scenario si è spostato nell'Europa dell'Est, più vicino a madre Russia. Un giro di vite dell'Occidente non tanto per piegare i giganti asiatici, quanto per lanciare un monito sul rispetto delle affermazioni economiche consolidatesi tra USA e UE. I recenti e frenetici incontri di Obama con i rappresentanti di mezzo mondo, prima del vertice del G7 sulla sicurezza, li ho visti come un qualcosa di grosso che bolle in pentola. Presto assisteremo all'annuncio di un accordo energetico tra Russia e Cina, ossia la fornitura alla Cina di gas Russo, accordo che presumibilmente verrà siglato in questo mese, nella visita di Putin a Pechino. Ciò determinerà un grande shock economico e geopolitico. Non solo potrebbe aumentare il prezzo del gas per gli europei, ma l’accordo apre le porte alla caduta del valore del dollaro. Non dimentichiamo che già da qualche anno la Cina con molti partner, per i propri scambi commerciali, non utilizza più il dollaro ma il renminbi, e sulle stesse intenzioni sembra orientata la Russia se si dovessero adottare sanzioni economiche contro di essa, da parte dell'Occidente. La forza del dollaro è riposta nell'accordo con l'Arabia Saudita, secondo cui i contratti petroliferi devono essere stipulati in dollari USA. La Russia è perfettamente in grado di sbarazzare i petrodollari. Le sanzioni spingeranno Mosca a creare un proprio sistema di pagamenti internazionale, proprio come sta facendo la Cina, e ad adottare altre contromisure di ritorsione. La Russia potrebbe facilmente abbattere i petrodollari richiedendo il pagamento non più in dollari, ma in euro o renminbi per le sue forniture di petrolio. L'Occidente rischia di escludere la Russia dal sistema di pagamento interbancario SWIFT per punirla per la sua politica in Ucraina. Ma in questo caso si dovrà passare a un'altra valuta, dato che le sanzioni si rivolteranno contro coloro che le adotteranno. Il destino dei petrodollari è nella mani della Russia, che può causare il più grande crollo del Dow Jones della storia economica planetaria. Mosca non ha fretta di adottare misure, ma intende rispondere “simmetricamente”. Se il denaro è il nervo della guerra -come asseriva Cicerone – la questione dei pagamenti reciproci potrebbe essere la scintilla di una polveriera situata in Ucraina, il cui scoppio potrebbe scatenare un susseguirsi di incontrollabili eventi da terza guerra mondiale. Giusto quello che dici (motivi economici, interessi delle super-potenze USA e Russia (ex-URSS), spostamento delle economie dei paesi europei, ecc.). Ma secondo me queste motivazioni si innestano su un qualcosa di molto più "duro" e preesistente ... da secoli! Si sovrappongono alle altre cause più profonte. E naturalemente, chi può cerca di sfruttare la nuova situazione. [Per cui non c'è da stupirsi nemmeno se in posizione anti-russa e filo-europea emergono gruppi di estremisti ... pressoché neo-nazisti!]. Le cause che dici tu si innestano e si sovrappongono ad una storia secolare di colonialismo russo, che qui in Ucraina è una parte molto consistente dell'intero colonialismo russo (come un'altra parte è quello sulla Georgia, un'altra ancora quello verso ovest – stati baltici e Polonia ... e modernamente – con l'URSS di Stalin – persino verso sud ovest se pensi che l'URSS post-bellica arrivava a confinare con la Cecoslovacchia della quale un pezzettino – rutenia sub-carpatica – è stato annesso da Stalin all'Ucraina, cioè all'URSS). Non bisogna dimenticare la storia martoriata dell'Ucraina, i cui confini e le cui etnie non-ucraine sono dipese dai soprusi e dai confronti belliscosi degli altri (Turchia, Austria, Prussia , Ungheria e SOPRATTUTTO e PER SECOLI Russia (zarista, sovietica e ora "putiniana"). Solženitsyn fa notare quanto straordinario è il fatto che nella periferia dell'URSS invasa dalla Wermacht di Hitler le truppe tedesche sono state accolte come liberatrici e; addirittura si formarono eserciti nazionalisti che combatterono contro l'URSS. [In Ucraina soprattutto: ma anche in Crimea – allora repubblica dell'URSS al pari dell'Ucraina – in Lettonia e in Lituania, in Finlandia ... e persino sorse guerriglia anti-URSS [e filo-tedesca] dove i tedeschi ancorano non erano arrivati (Caucaso, Georgia, ecc).. La tesi di Solženitsyn (che io condivido) è che tali e tante erano le vessazioni subite dalle popolazioni non-russe che esse si sarebbero alleate con chiunque contro il potere centrale di Mosca. In particolare l'Ucraina. Ho già ricordato che Lenin, nella riedizione di "Imperialismo, fase suprema del capitalismo", dice che nella precedente edizione, come esempio di imperialismo aveva portato qullo del Giappone sulla Corea solo per passare dalla censura zarista ma – avverte Lenin – il lettore intrelligente mettera Russia al posto di Giappone e Ucraina al posto di Corea. Finalmente l'Ucraina credeva di essersi tolta di dosso il giogo russo con la "Pace di Brest". Alla fine della 1ª guerra mondiale l'Ucraina era indipendente (al pari della Polonia e della Cecoslovacchia). Ma l'indipendenza durò poco! L'URSS se la riprese ben presto! E' anche da ricordare che Stalin, proprio per fiaccasre il dissenso ucrainio, sottopose l'Ucraina ad un regime di ristrettezza alimentare che causò la morte per fame di milioni di persone. Per non parlare delle devastazioni del territorio, da sempre famoso per la fertilità del terreno e trasformato dalla Russia in sede di industria pesante (quasi tutta a scopo miliare). [E non si dimentichi nemmeno che le centrali nucleari in Ucraina producevano sì energia elettrica: ma quasi come ... "sottoprodotto", in quanto lo scopo principale della loro esistenza era la ricerca e lo sviluppo di bombe nuclari sempre più progredite! [Lo stesso catastrofico "incidente" di Cernobyl  è dovuto alla sospensione dei controlli automatici per superare un po' la soglia dellareazione nucleare consentita dai controlli automatici per permettere speciali sperimentazioni sempre in ambito di armi nucleari]. Se poi aggiungi la vera colonizzazione, nel senso dell'arrivo di russi per occupare i posti chiave amministrativi (che nell'URSS comprendevano pure quelli commerciali! ), della magistratura, ecc. ecc (avvocati, medici, insegnanti, consulenti economici ...) il quadro è completo! Persino il "regalo" dell'intera Crimea all'Ucraina va visto come manovra di "colonialismo imperialista" di cui aveva parlato Lenin! La popolazione autoctona della Crimea era stata deportata in massa sotto Stalin, (e anche eliminata col continuo stillicidio degli arresti [nelle residue popolazioni non deportate] di presunti nemici del socialismo). I russi in Crimea, nonostante il giogo russo da secoli, erano una netta minoranza prima del 1944. Svuotata praticamente la Crimea dei suoi abitanti autoctoni, la Repubblica Socialista Sovietica di Crimea fu abolita e il territorio annesso alla Repubblica russa ... e pian pianino ripopolato da russi. Al momento del passaggio della Crimea all'Ucraina la popolazione russa era già in netta maggioranza. Ecco dunque la bella mossa di Kruscev: da una parte frenare il dissenso popolare (di tipo nazionalistico) mostrando la grande amichevole generosità della Russia, dall'altra infiltrare in Ucraina una buona dose di russi (ben piazzati nelle leve di conduzione politico-economica di stile sovietico) per ridurre il peso politico del dissenso (serpeggiante anche nel partito comunista dell'Ucraina, ufficialmente a guida della Repubblica). Comunque, la Russia di Putin, per mantenere il controllo siull'Ucraina, ha dovuto fare quello che non era in programma!